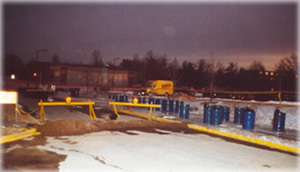 Attempt to contain an outdoor PCB spill outside Parker Theater in January 1992. Photo by Eric Francis for Student Leader News Service. Dioxin Dorms is offered as a public service to students and alumni of SUNY New Paltz and their families. It was created with the assistance of Anatoly Ryzhenko in the Ukraine, Tania Derck in Belgium, Carol van Strum in Oregon, and Danielle Voirin in France. It is published by Planet Waves, Inc. of Vashon Island, WA, all rights reserved. To reach Planet Waves, call (877) 453-8265 or email info@planetwaves.net. Why are people from around the world working with a company in Washington State to do this? I have longtime connections with the Hudson Valley and still consider it my home. This work, for me, is simply about taking care of my community, no matter wherever I happen to be in the world. There are numerous places like New Paltz, contaminated by the PCBs and dioxins created by GE, Westinghouse and Monsanto, and left in neglect by their local health departments. We are part of one movement, though we don't all realize it yet. It has mainly been through the sacrifices and struggles of the people in the Five Rivers area of Oregon, the people of the Love Canal neighborhood in Niagara Falls, New York, and the plaintiffs of Bloomington, Indiana who suffered many brain tumors at the hands of Westinghouse, that the information on this website is available to you. I also wish to acknowledge Edward Bates and many of his employees of the Power Test Division who died of brain tumors and lung cancer in Pittsfield, Massachusetts at the hands of General Electric. Additional thanks to Mud Puddle (Beth) in New Paltz, The Professor (Jenna Dern of Synthesis in New Paltz), The Eclectic Muse (Pam Purdy of Vashon Island), Deirdre Tanton in Germany, Priya Kale in New York and Chelsea Bottinelli in Florida. Thanks to all the members of the Hudson Valley community who continue to offer their support, including Karen Pardini and the Grandmothers, Dr. Ken Nestler, Chris McGregor and Manna Jo Greene. At different times in my work I have been assisted by Peter Shipley, Paul E. Merrell, Esq., Bill Snyder, Paul Rauber at Sierra, Dr. Paul and Mrs. Ellen Connett, Parry D. Teasdale of Woodstock Times, Sean Springer, Ian McGowan, Jesse Welch, Father Damien, Dave DeLucia, Lois Gibbs, David McCrea, Esq., Steven R. Faber, Esq., Dr. Peter Montague, William Schapp, Esq., Steven Sandberg and his attorney Bruce Brusavich, Esq., Dr. Ward B. Stone, Dr. David Carpenter, Dr. Brian Bush, Bill Farrell, Hilary Lanner Smith, Michael Rogers of Raw Story, Erik Janssen of Dept. of Planet Earth, Hudson River Sloop Clearwater, The Journal of Pesticide Reform, Brian Mahoney, my editor at Chronogram, and many other people and organizations who assist the movement for environmental justice.